Private George Dean was born in Beeston in 1892 2, the eldest son of George and Elizabeth (née Cox, formerly Morris) Dean3, part of a large family of three siblings (one of whom, Agnes, his sister, had died in 1909), seven step sisters from his mother's first marriage and a step-brother from his father's earlier marriage. In 1901, he was living with his parents, two brothers, a sister and five half-sisters at 4 Denison Street, Beeston4. George Dean senior, a native of Staffordshire, worked as a coal miner. By 1911, when his parents and remaining family were living at 53 Wollaton Road, Beeston, the junior George had left home. It appears that his mother died towards the end of 19125. As George Dean was not with the family in 1911 and has not been found elsewhere on the census in that year it is possible that he had already enlisted in the Army and had somehow been missed in the 1911 enumeration. 1st Battalion, King's Own Yorkshire Light Infantry, with which he was eventually to serve, was then stationed in Singapore6. When War was declared in August 1914, the Battalion was recalled from Singapore, landing at Southampton on 9th November 1914. The Battalion, then including Private Dean, embarked for France on 15th January 1915, landed at Le Havre on the next day and took up positions in the Ypres Salient7. By 22nd April 1915, the Battalion, as part of the British Army's 28th Division, 83rd Brigade, was fighting in the 2nd Battle of Ypres, in the Ypres Salient. It was during the early stages of this battle when poison gas was first used by the German Army against the French sector of the Allied lines. During heavy fighting, the Battalion sustained heavy casualties and endured several gas attacks. On 24th May, two companies from the Battalion moved to reinforce the line about 200 yards south of the Menin Road. It was during this operation that a high explosive shell hit the building were the companies were, killing 11 soldiers including Private Dean8. It appears that he and his colleagues were buried originally at the nearby Asylum British Cemetery, in the grounds of the Hospice du Sacre Coeur, a mental hospital, in Ypres, a little West of the railway station, between the Poperinghe road and the railway. This was used by Field Ambulances and fighting units in the area from February 1915, to November 1917. After the Armistice, the burials there, including those of Private Dean and his colleagues, were removed to Enclosure no. 2 at Bedford House Cemetery. Tragically, two others from Private Dean's family were also killed in the War. His brother, Charles Dean, serving with the Sherwood Foresters, was killed on 9th May 1915 and a step-sister's husband, Albert Mee, died on 10 December 1917 while serving with the Royal Field & Royal Horse Artillery. George Dean's youngest brother, Bertie Leonard Dean, (b. 1899) was too young to serve. He later left for Western Australia, naming his only son George. It is believed that he had become the owner of at least one of his brother George's medals (he was awarded the Victory Medal, British Medal and the 1915 Star) and handed it on to his son before his death in 1971. 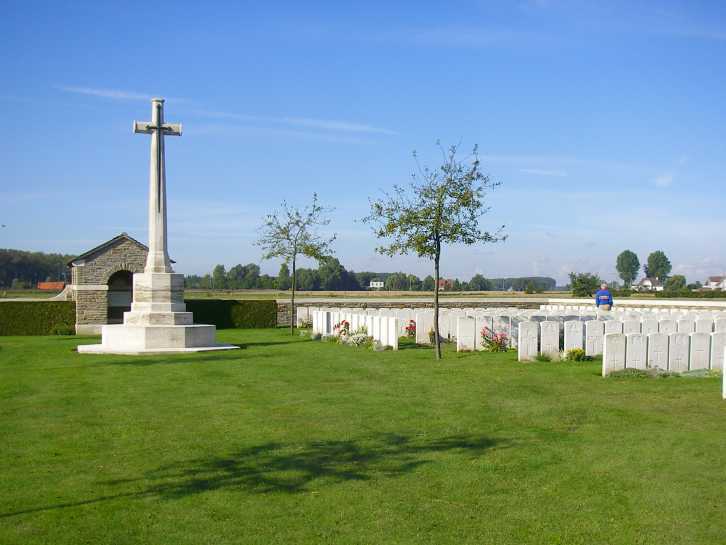 Bedford House Cemetery9 - is located 2.5 km south of Ypres town centre. The cemetery lies on the Rijselseweg (N336), the road connecting Ypres to Armentieres. Bedford House, sometimes known as Woodcote House, were the names given by the Army to the Chateau Rosendal, a country house in a small wooded park with moats. Although it never fell into German hands, the house and the trees were gradually destroyed by shell fire. It was used by field ambulances and as the headquarters of brigades and other fighting units, and charcoal pits were dug there from October 1917. In time, the property became largely covered by small cemeteries; five enclosures existed at the date of the Armistice, but the graves from No.1 were then removed to White House Cemetery, St. Jean, and those from No.5 to Aeroplane Cemetery, Ypres. Enclosure No. 6 was added in the 1930s as graves continued to be found in the battlefields of the Ypres Salient. In all, 5,139 Commonwealth servicemen of the First World War are buried or commemorated in the enclosures of Bedford House Cemetery. 3,011 of the burials are unidentified but special memorials commemorate a number of casualties known or believed to be buried among them. Other special memorials name casualties buried in other cemeteries whose graves could not be found on concentration. There are 60 Second World War burials (3 of which are unidentified). There are 2 Germans burials. 2It appears that his name was registered at birth as George Alfred Dean (Basford Registration District Q4/1892 Ref 7b 205). He is recorded as 'G A Dean' on the memorial in Beeston Parish Church. All other discovered records omit the middle initial or name. 4Beeston 1901 Census : Piece 3153 Folio 28. There were at least seven children from Elizabeth's marriage to George Morris and a son from George's first marriage. George and Elizabeth had at least four children, Agnes (about 1892), George (about 1893), Charles (1896) and Bertie (about 1900). 5Her death appears to be recorded in Basford Registration District Q4/1912, Ref 7b 209 - age 55. Significantly, Charles' backpay (£5 17s 9d) and War Gratuity (£3) were paid to his father (Army Register of Soldiers' Effects - Record 172948). 6The Battalion in Singapore, like all of the British Armed Forces abroad, were enumerated as part og the 1911 Census. Although George Dean is not listed, it is interesting that two others were born in Beeston - Private Samuel Alvey, age 28 and Lance-Corporal Frederick Edward Evelyn Booker. 7Although his Service Record has not survived, his embarkation date recorded as a 'qualifying date' on his Medal Roll Index Card in relation to entitlement to the 1915 Star. 8These accounts of offensive operations in April and May 1915, are based on the War Diary of 1st Battalion, King's Own Yorkshire Light Infantry. Heavy officer losses meant that, at times, it was not found possible to maintain this diary.